...and yet I've posted it anyway. In a certain odd way it's a good introduction to this post. Some readers may recall that earlier this summer I was designing some new fabrics using a new (to me) yarn. I thought the new fabric would be a wonderful addition to the color-grown cotton sweater knits and the reclaimed fabric panels I currently have in the shop. The colors were gorgeous, the yarn soft, and 70% of the fiber was recycled cotton. Thirty percent was polyester, which made the recycled cotton strong and a better knitting yarn. Then I read about a research project conducted by a team of graduate students at University of California Santa Barbara's Bren School of Environmental Science & Management for their client Patagonia, the outdoor apparel company. Very briefly, for those unable to read project findings right now, the research team studied the microfiber and microplastic pollution in our oceans. This pollution begins in our washing machines after synthetic fabrics are laundered. These very tiny particles eventually reach the ocean, are consumed by fish, and end up in our food chain. The research group reviewed previous studies and conducted their own experiment. "To quantify microfiber shedding from washing synthetic jackets, [the researchers] conducted a series of wash experiments" using high-end (Patagonia) and budget synthetic fleece jackets. You can download the full 105-page report, a four-page summary of the report, and an infographic, if you scroll to the bottom of this page. Two interesting findings are that "top-load washing machine trials had 5.3 times the microfiber shedding of the front-load machine trials and... aging of jackets increased the mass of fibers shed by 1.8 times." It turns out that a very good solution to this problem may come from research into the way textiles are laundered and the way in which textiles are made. Check out the Benign by Design and this presentation Mark Anthony Browne. Although I've personally preferred the look and feel of natural fibers, I do understand the allure that a synthetic fabric can have. A synthetic fabric is usually less expensive than natural. Synthetics dry more quickly and with fewer wrinkles. "Performance" polyester fabric will wick moisture away from the body, (but then so will wool.) It's my understanding that the fibers from certain natural fabrics, especially those treated with dyes and other chemicals, can also contribute to the clothing fiber pollution problem. This summer I chose to reorder natural and color grown cottons. 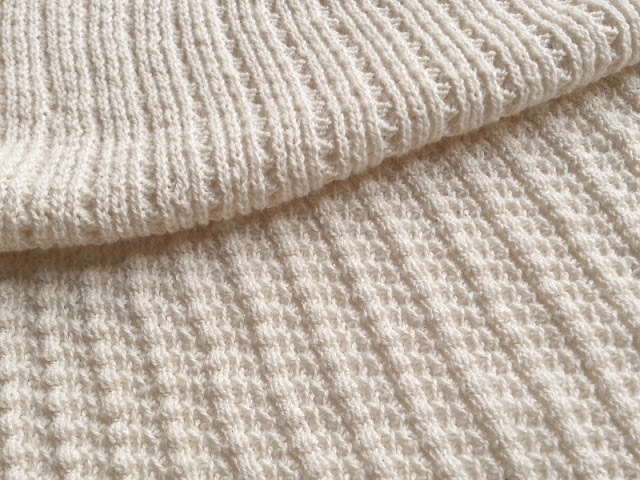 My venture into producing recycled cotton/polyester sweater knit is on hold for the time being. My love of natural fabric runs deep. It's not just the look and feel; it's the sewing, too. When there's steam involved (as needed in the construction of a sweater) the more natural fiber, the better, as far as I'm concerned. Yes, I'm the type of person who'll always be inspired to sew based on the fabric alone. Never mind a particular style of garment or wardrobe need I may have. I publicly declared my love for natural fabric in "A Personal Look at Natural Fabrics" on PatternReview a couple of months ago. My current thoughts on fibers wouldn't be complete without a mention of this unusual fiber. Below is a picture of a fabric, knitted with a fiber developed from natural materials -- bacteria and fungi. Could this one day be a "a sustainable alternative to conventional textiles"? The team began with observations about the wastefulness of fashion: “It’s the second most polluting industry,” they noted in their presentation. They then spent months experimenting with different formulas of the biomaterial, curious to see how much it would stretch. They tested an early version of the knitted filament in FIT’s textile testing labs, where they discovered, to their surprise, that it stretched 70 percent beyond its original length. They also customized a 3D printer to make a mesh version, which stretched 50 percent. More about their fiber can be found on Ecouterre with lots of pics and a video, too. Now this is the time where I'd really like to make some sort of concluding, semi-profound statement about fiber and research and the environment, but I don't have one. I'm glad that there have been some hopeful notes throughout this post. If you've got any thoughts on any of this stuff, please leave a comment. Thanks. Thanks so much for posting this. I was at a Joann's store the other day and nearly all of the fabric was polyester. It's discouraging to think that so few of us are aware of the problems caused by polyester -- and posts like yours will help! I would like to re-post this on my blog, www.denisekovnat.com, with your permission. Denise, I'm very pleased to have you re-post this. Thanks for asking, but mostly thank you for helping to make others aware. Also, polyester fibers in wastewater do not have to end up in the oceans or rivers. If you live in a city with modern waste water treatment plants, the fibers will be trapped out. Here's a photo tour of a modern water treatment plant in Los Angeles County. As an environmental scientist, I can not stress enough that natural is not always better. Especially when it comes to cotton. I avoid organic cotton because of it's heavy impact on already water-scarce areas where it is grown. Actually, we are in agreement more than you suspect. It's my understanding that a major part of the environmental impact occurs after the garment is in the hands of the consumer. It's the washing-softening-rinsing repeatedly, then throwing away. I discuss this a bit in my recent post It's Earth Month! I personally prefer the feel of 100% cotton to cotton/poly blend. I have also found that synthetics need to be washed more frequently than cotton or wool, because synthetics more readily pick up and hold odor. Polyester blended with cotton, however, often makes a fabric easier to machine knit and longer wearing. Microfibers in the waste water remain a problem in many places. According to Browne, solving the problem of microplastics in the oceans may very well come by way of advanced filtering. These advanced filters are still being developed. From the UC Santa Barbara Bren School report, "To understand the fate of microfibers after leaving the washing machine, we developed a model of microfibers in wastewater treatment plants (WWTPs). Based on a literature review of wastewater treatment plants, we estimated the mass of microfibers entering local water bodies using a microfiber removal rate between 65-92%. Based on these removal rates, a city of 100,000 people produces 170-441 kilograms of microfibers from washing synthetic clothing per day. Of the amount of microfibers that enter the WWTP, 9-110 kg of microfibers would be released into local waterbodies daily, which is an average of 15,000 plastic bags." The other area of research that may help solve the microfiber problem is in textile production; that is, learning how to spin or extrude fibers, natural and synthetic, then knit or weave or (??) them so that they don't break down as easily in the wash. I too avoid organic cotton. The cotton I use for production is from the Sustainable Cotton Project -- biologically-based pest management, fewer chemicals than conventional, less water used than for organic. Very lovely post.. This is very interesting and helpful post.. Ellie fashion brand is a nice brand and is my favourite.. I always like to purchase things of this brand only. I always look out for new and stylish fashion trends and ideas for the gym . You have helped me a lot in choosing the best style .